On 11th August 2018, Election Commission of Pakistan announced the allocation of reserved seats for women and minorities in the National Assembly of Pakistan. In the General Elections 2018, Pakistan Tehreek e Insaf (PTI) emerged as the largest party. Pakistan Tehreek e Insaf (PTI) won 116 General Seats in Elections 2018 Pakistan and later on 9 out of 13 Independent candidates joined the PTI which increased its General Seats to 125. Election Commission of Pakistan allocated the 28 reserved seats for women according to constitutional formula to the PTI along with 5 reserved seats for minorities, which means total seats of PTI in National Assembly of Pakistan are 158. In the House of 342, party needs 172 seats for the simple majority and PTI have 158 seats which mean it only needs 14 seats to achieve the simple majority. While keeping in view the number of seats won by its allies, PTI is sure to get the simple majority in National Assembly required for the election of Prime Minister. Pakistan Peoples Party is the third largest party in National Assembly in Elections 2018. PPP won 42 General Seats in the Elections 2018 and Election Commission of Pakistan allocated 9 reserved seats for women and 2 for minorities according to written formula. It makes total strength of Pakistan Peoples Party 53 in National Assembly.Pakistan Muslim League-Nawaz (PML-N) is the second largest party in National Assembly of Pakistan. PML-N won the 64 General Seats in Elections 2018 but no independent joined the party. ECP allocated 16 reserved seats for women and 2 for minority to PML-N, which means its total strength in National Assembly is 82. 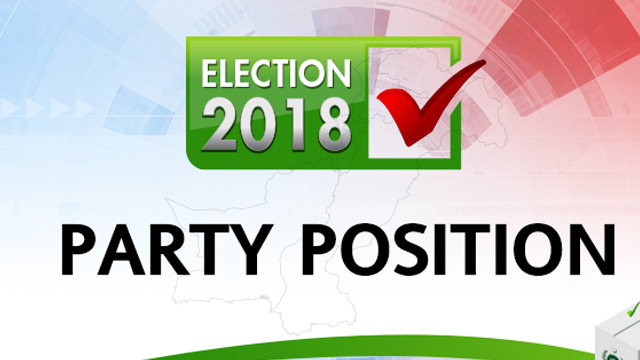 Muttahida Majlis-e-Amal (MMA), an alliance of religious parties, won 12 seats in the General Elections 2018. According to formula, ECP allocated 2 reserved seats for women and 1 for minorities to MMA, which takes its final tally to 15 in National Assembly of Pakistan. Muttahida Quami Movement Pakistan (MQM-P) is emerged as fifth largest party in National Assembly of Pakistan after Elections 2018. It secured 6 General Seats and after allocation of one reserved seat for women its final strength is 7 in National Assembly. Other prominent parties include PML-Q with 5 and BNP with 4 seats in National Assembly.